Nail Polish Vintage yet Modern , This year my husband and I decorated the house in lights, and put up some fuss in the house in the way of decorations. Unfortunately we didn't get to partake in so many Christmas parties as we'd hoped. Our neighbors invited us over for a viewing in their backyard of It's a Wonderful Life. It was our first time going there for a social event and I wanted to make a good impression. 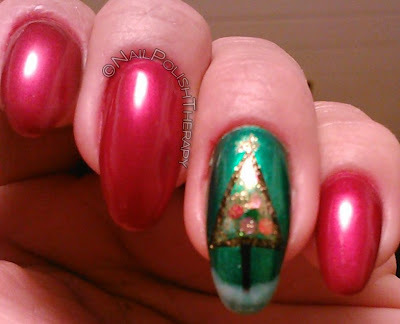 So I set out to make a vintage yet modern Christmas tree art. 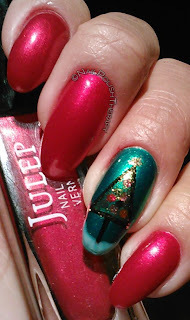 I used Julep: Glen for most of the nails and then Cynthia Crowley for the accent nails. Both of these colors are absolutely glorious. The formula was great and dried super fast. My only complaint was that the Cynthia Crowley (green color with no name) was HORRIBLE to take off. Stained my nails something awful. 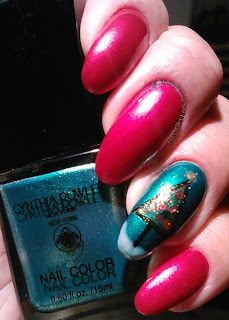 The other colors I used on the tree and snow were: American Apparel Galaxy, OPI Golden Eye, Milani Black Sketch, Revlon Calla Lily. 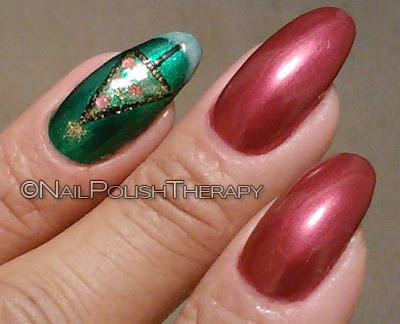 The shape of the tree was modern to me and the overall look with the OPI Golden Eye added a vintage touch. What are your thoughts? Feelings? Concerns?